In Bulgaria, I have learned, nothing is what is seems to be at first glance, and words, no matter how clear, often refer to alternate realities (click here for my long-ago online discourse on the wisdom and convenience of the oft-heard Bulgarian-language phrase po printsip, tr. “in principle”). During my last visit to the Bulgarian capital, Sofia, back in February and early-March of this year, demonstrators poured into the center of the city to join marches protesting over-inflated energy charges, these resulting from a cynical game of arbitrage and manipulation of subsidies by insiders. 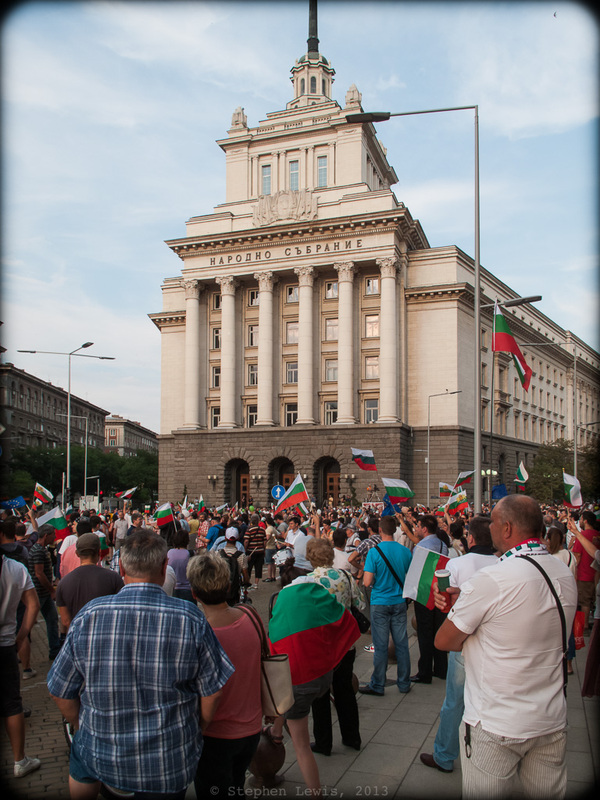 The demonstrations differed from the norm in that, this time, the majority of the marchers were from the Soviet-bloc-era housing developments at the fringes of Sofia — low income people, thus, caught in a squeeze between minimal incomes, lack of savings, and the soaring prices of inelastic monthly expenses. The February and March demonstrations led to the cavalier resignation of the right-of-center government of Prime Minister Boyko Borisov, a Communist-era one-time state security heavy and a recent mayor of Sofia whose shaved skull, protruding jaw, and characteristic bombast are reminiscent of Mussolini. “Brother Boyko,” as he sometimes is called, simply threw up his hands and called for elections, thus, in effect, abandoning the country and dumping the entire mess into someone else’s lap. As Shakespeare wrote in The Tempest: “ … misery acquaints a man with strange bedfellows;” likewise the coupling that comprises the government formed to replace that of Brother Boyko. Current coalition partners include the BSP (successors to the old Bulgarian Communist Party) plus two small parties that survive by playing the roles of coalition-brokers: the DPS (Movement for Rights and Freedoms, a party originally founded to defend Bulgaria’s million-strong Turkish and Muslim minority against state and social oppression) and ATAKA (an out and out neo-nazi party whose platform and appeal is based on anti-Semitism and hatred and disenfranchisement of Bulgaria’s large populations of Gypsies and Turks). One of the first acts of the new coalition was inexplicable, even by Bulgarian standards: The appointment of an oligarch with known ties to organized crime as head of the country’s national security agency. In response, one month ago, crowds took to the streets of Sofia and of cities and towns elsewhere in Bulgaria in daily protest marches. Within ten days, the appointment was withdrawn just as inexplicably as it been made in the first place. The demonstrations, however, have continued. And this brings us back to my opening paragraph above: the Balkan blurring of what is said and what is, and what is and what could or should be. One of my local interlocutors, a successful medical practitioner, explains that the demonstrations are an uprising of the new middle class. Another — an energetic and articulate young independent consultant — adds that the demonstrations represent the entry of her generation into the politic arena. And yet, when I visit the demonstrations, what I notice are embittered folks, in large part pensioners and the seemingly un- or under-employed, as well as a sprinkling of deadbeats swilling from liter bottles of beer or wearing t-shirts decorated with iron crosses or other iconography of the know-nothing right. The signs I read and slogans I hear at the demonstrations are mostly rants against communism; the communist period, by the way, having ended one year short of a quarter of a century ago. A sprinkling of English-language signs, featuring liberal use of words such as “motherfuckers” and “bastards,” reveals the tenor of discourse. A friend of mine who is a close observer of of local Facebook activity and print and broadcast media offers another take, i.e. that the protests have offered the media-savvy a low-risk opportunity to engage in “reputation management” and profile themselves as a new class of courageous leadership. She also suggests that the demonstrations are likely to be used by Brother Boyko as a pretense for a magnanimous return to power. Another friend — a former communist and present-day socialist, who has always had the integrity to speak out against the abuses of both parties — regrets that recriminations and shapeless discontent seem to be the language and output of-the-day of the Sofia protests, rather than a focus on concrete issues or the formation of a sustainable new opposition, this unlike contemporaneous events in Istanbul (see my previous post on issues and aspersions). A third friend, a woman who has worked in the private sector in Bulgaria from the very first days of post-communist “market” economy, emphasizes that no party directly confronts the core issue of a divorcing government and the economy-at-large from organized crime. As to me, I’m yet sure what I think — except, of course, not to trust my first impressions. My next step, thus, will be to get myself back to thinking Balkan. So, for the coming days at least, I’ll simply continue to enjoy the cool weather and refreshing periodic thunder storms and lose myself in the excellent local tomatoes, “feta,” and schnapps. While I do so, please feel free to post your comment(s), whether in English or Bulgarian. You miss the place of Big brother Boyko now. Also the attempts of old sharks to come back in power again. Against the oligarchs – who are they ? Fight between several strong economic groups , using the anger of 23 years of roaming in the free market economy , which happened for most Bulgarians an arid desert. Many thanks, Ronny. You’re on-target and concise as always. Let’s discuss in further detail so that the next time I post about this I can go a step deeper.